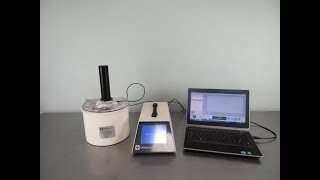 The Biogenics Crysalys Cryocontroller PTC-9500 provides a reliable, portable and accurate means of monitoring status of precious samples, with an easy to use touch control. This Cryo Process Management System has a targeted PID control that eliminates possible detrimental EMF interference, with a proportional DC, steady-state current to regulate chamber temperature. This cryocontroller also protects samples with constant monitoring and an internal battery for uninterrupted use in the event of a power failure. This battery will run for up to 4 hours in the field and can also be used with a 12VDC adapter for use with an automotive power system. Along with these safety features, this digitally controlled cryo manager allows users to access data from the connected Windows computer with Crysalys Cryolink software. This cryo management system is partnered with a DX2.5 LN2 Cryobath, with extra tall lid to accommodate cryovials. The Biogenics Crysalys Cryocontroller PTC-9500 logs and archives data, shows realtime temperature graphs and performs controlled rate thawing from the intuitive 5.7 inch full color touch-screen graphic interface. This microprocessor controlled Cryo Management System time stamps for every program run onto an onboard SD card, at a sample rate of at 10 per second, recording every 6 seconds. The PTC-9500 will store up to 16 user protocols, each with up to 100 steps. This Portable Cryo Management System controls the rate of cooling and thawing at 0.1°C/min with a controlled range of +50°C and -196°. This Biogenics Crysalys Cryocontroller PTC-9500 has been fully tested by our service team with a clean bill of health. Once buyer receives the instrument, they'll need to re-calibrate the instrument on their bench. All of our lab equipment comes backed our standard warranty. Should you have any questions, please don't hesitate to contact us.